Welcome. Let's begin with a completely unpainted figure. Most figures are made of pewter or lead and come in a plastic blister pack. a multitude of manufacturing sins. and sanding down any seam lines that are left. coat you would like to use. brightness of the figure can be altered depending on the base coat you use. For a darker, villainous character, I will usually use black for the base. mean that generally, the character will be brighter and more "heroic"
silver armor) though I tend to base the entire mini. equipment to keep the interest of a viewer. later could have disastrous results!!! and Humbrol Aluminum metal cote (the only oil based paint I use). browns.I will outline some things with white (like the armor trim). shading, though your first impulse will be to groan in horror!!! greys though I've started using blue. Now your miniature will be very dark. where you originally had them. the key is to not blotch too much on. Notice how the original colors come back as you apply more and more "dustings"
and even hiliting can be drybrushed. However, drybrushing can leave a "flaky"
doing all of the shading. start with wider areas and slowly apply smaller amounts as the surface raises. using the same base color makes the blending easier. can work nice for that too. a tiny glint spot can be added. the darkened edges to give a real nice shine and contrast. reflection is applied in the darkest area. with thin lines of black (or another dark color) to make them stand out more. it is textured. The options are almost limitless. bits off before you spray your mini! 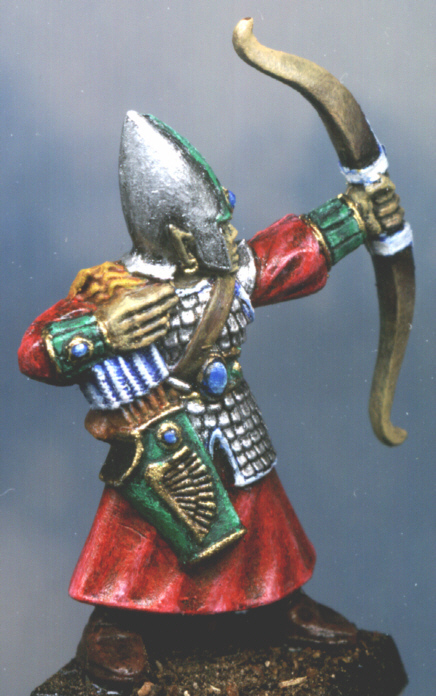 Now you have a sharp looking archer to put in you display!!! !